Singapore already limits the number of cars added to its roads, but starting February next year, it is not going to allow more cars. Currently, the annual private vehicle growth rate is 0.25%. Starting February, it will be 0%. The rules for being able to drive your car around are fairly strict. You have to buy a special certificate from the government to drive your car. The certificate is bought through a bidding process and is good for a certain number of years. After that, the certificate goes back into the bidding process. 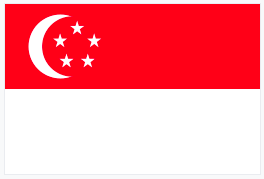 Singapore is a teeny tiny country. Traffic congestion is a big problem and twelve percent of the country’s total land area is taken up by roads. 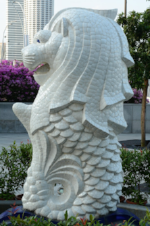 The Merlion, a mythical creature with a lion’s head and a fish’s tail, is a national symbol of Singapore.